The key to making bite-size pieces of heavenly deliciousness is mixing the batter by hand to avoid the butter to become too warm, and in turn, too soft. Not only are these cookies delicious, they are also loaded with brain-boosting walnuts (which are loaded with omega-3 fats), anti-cancer properties of oats, as well as semi-sweet chocolate, which is loaded with anti-oxidants. 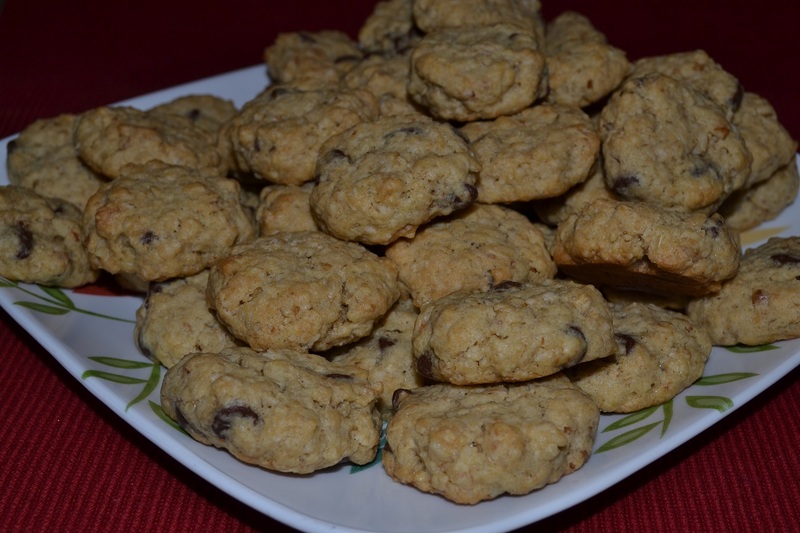 In addition, with a couple modifications, these cookies make super-delicious vegan cookies. 1. Heat oven to 350° F. In large bowl, mix sugar, butter, vanilla, and egg by using spoon or fork, until well-blended. Add oats, baking soda, and salt. Stir in chocolate chips and nuts. 2. On cookie sheets lined with parchment, drop dough by rounded tablespoonfuls about 2 inches apart. (I like to form mini round discs by hand.) Bake 9 to 11 minutes or until golden brown. Cool slightly; remove from cookie sheets to cooling racks. 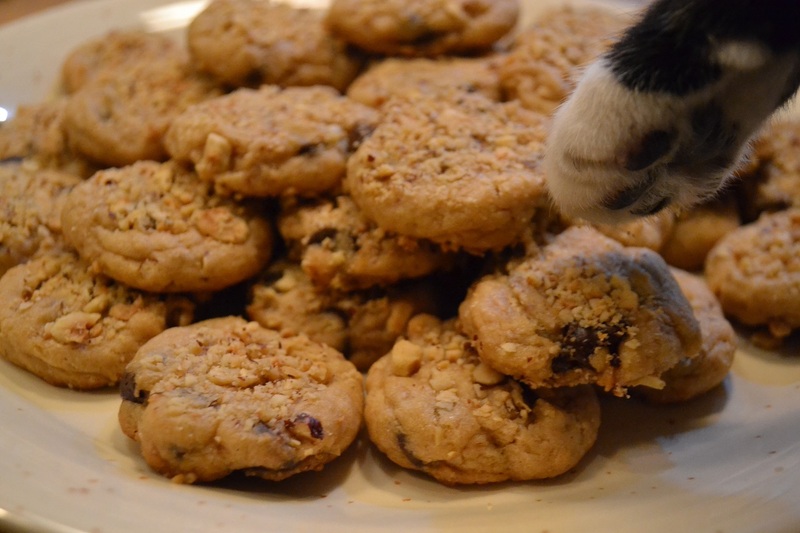 Categories: Cookies & Treats, In The Kitchen | Tags: chocolate chip, cookies, oats, vegan, vegetarian, walnut | Permalink. As anybody in Tally knows, I love to bake…and I am always in search for another great cookie recipe. 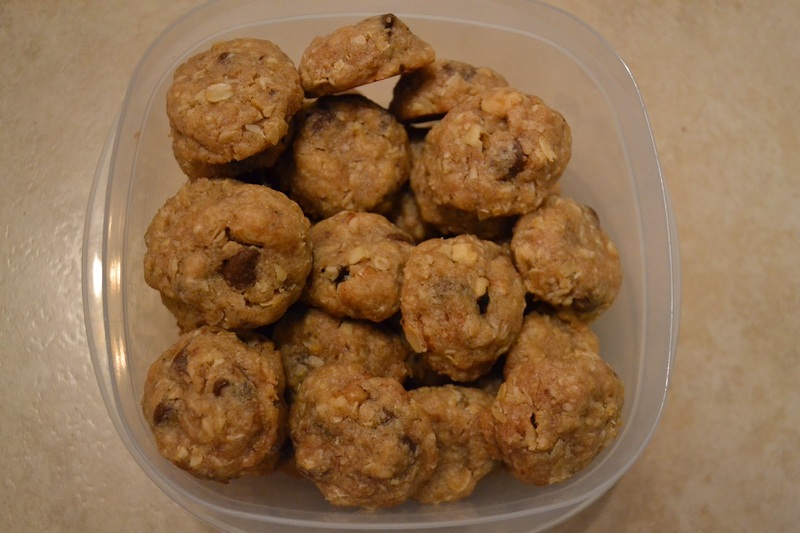 My favorite recipe is still the oatmeal chocolate chip walnut cookies, even though the “nutella cookies” are a close second. This past weekend, I was cleaning part of my computer and came across a recipe that I never tried, nor do I know where it came from. 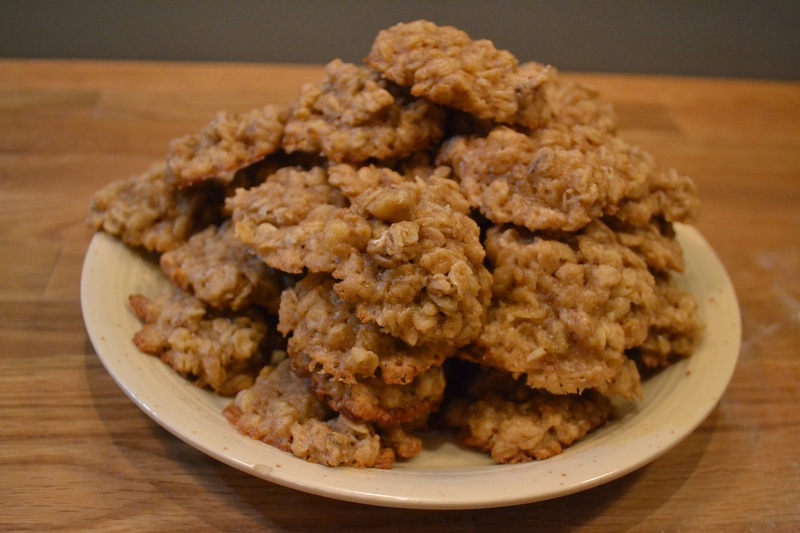 I made a couple minor modifications and wanted to share the recipe, as these cookies are wonderfully delicious and moist. To get ready for Thanksgiving: As I was making Crock pot tortilla soup (recipe to come soon) and a German “Apfelkuchen” recipe (recipe to come soon), I was searching for the cookie recipe to make “muffin tops”. I realized that these weren’t even labeled as such. Hans called them “muffin tops” as they are supersoft and have the consistency of muffin tops. Anyhow…after not being able to find the recipe right away, I renamed them. 1. Pre-heat oven to 375 Fahrenheit. 2. Mix butter, sugar, and pumpkin thoroughly by hand or large wooden mixing spoon, in a large mixing bowl. Add egg and mix thoroughly. Then add the dry ingredient and mix again. Finally toss in the chocolate chips and mix. The dough will be gooey and sticky. 3. Drop spoonfuls (I used a very generous teaspoon for each cookie) of cookie mixture onto baking pans lined with parchment paper. Bake for 30 minutes (Believe me, I could not believe it…baked the first batch for 15 minutes…another 10…and another 5 minutes). When done, let cool for ten minutes before consuming. 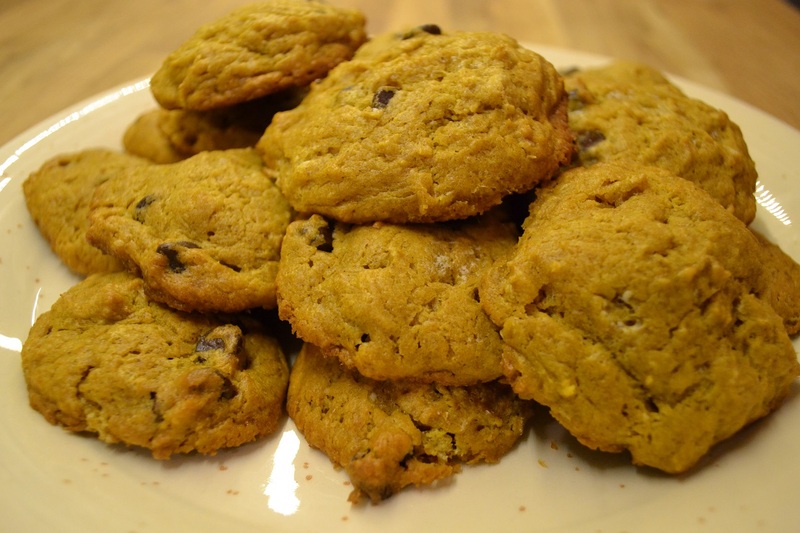 Categories: Cookies & Treats, In The Kitchen | Tags: chocolate chip, cookies, moist, pumpkin, vegetarian | Permalink. 1. Mix all the dry ingredients (except sugar) together. Mix the shortening, sugar, molasses, and egg together, separately. 3. Place sugar-covered ball on cookie sheet that is lined with parchment paper. Bake at 375 F for 8-10 minutes. 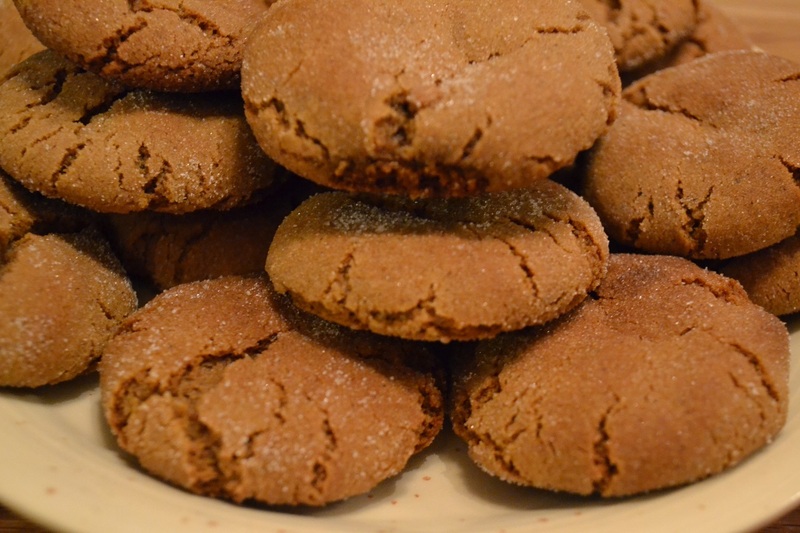 Categories: Cookies & Treats, In The Kitchen | Tags: cookies, molasses, sugar cookies, vegetarian | Permalink.